To reduce the human-caused spread of invasive species by promoting behavior change. Robert Wiltshire founded the Invasive Species Action Network in 2008 realizing that the current efforts to address the aquatic invasive species problem fell short. 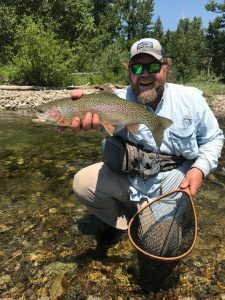 With a well-rounded career conducting wild trout studies for the state of Montana for over 15 years, small-business entrepreneur in recreation and hobbies, and conservation non-profit manager for more than a decade, Bob navigates his current role as director with ease. He has played key roles in the management of invasive species over the years including serving on the Montana’s Whirling Disease Task Force, co-authoring the Western States New Zealand Mud Snail Management plan and currently serving on the National Invasive Species Advisory Committee to the White House. Leah Elwell joined ISAN in 2010 as seasoned hand in invasive species issues and research. Many years of river ecology research created a desire to protect our water resources from invasives. She holds a graduate degree in Biology which focused on complex interactions of whirling disease host species. 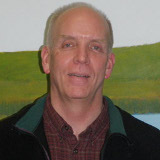 Elwell has provided a variety of publications as author on ecology and management of whirling disease and didymo. She has been featured in an educational film on whirling disease research. When not dreaming up new ways to change the world for good, Leah is digging in the dirt, hiking the hills and having fun with her family. Matt Wilhelm joined ISAN in 2009 with over 12 years of experience reaching out to youth on aquatic education. Matt specializes in teaching concepts about river ecology, aquatic invertebrates, native fish species, aquatic and weed invaders, and fly angling education. Wilhelm has been a contract provider of aquatic education needs in schools across Montana for the last 20 years and has worked with nearly 100,000 people over the years. He is a nationally recognized instructor who has been teaching teachers about fly fishing and in 2004 he was honored with the Montana American Fisheries Society Aquatic Educator of the Year Award. In 2018, Matt was recognized by the Montana Environmental Education Association with the Sense of Wonder Recognition Award. Wilhelm has been featured as an educator on local, regional and national TV programming, including ESPN. Matt is also owner of the Yellowstone Fly Fishing School and holds a Fly Fishers International Master Fly Casting Instructor Certification. When Matt is not teaching, you will find him wading or floating the river. 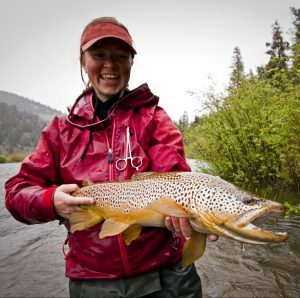 Our newest member of the team, Marya brings with her a decade of experience in the fishing industry. 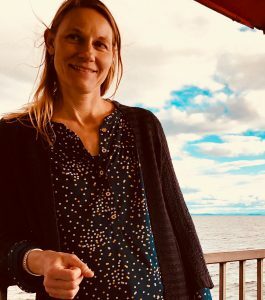 By spending her summers as a fishing guide and in fishing retail, and her winters as a dogsledding guide, her career has long revolved around water in its various forms. Through these experiences Marya has seen first-hand the relationship between water and her local economy, a complex relationship that over time fostered in her a desire to do more for those who enjoy spending time on the water. When she isn’t guiding or working on our various outreach programs, Marya beats the door down to spend some more time outside. We consider ourselves lucky to have board members who active in our local community and interested in helping us to get the word out about preventing the spread of invasive species. Are you interested in helping us to reduce the human-caused spread of aquatic invasive species? The Invasive Species Action Network is seeking to make an impact in areas of business and conservation to show that every small positive behavior change is a victory in the fight against invasive species introduction and spread. Learn more about the position here: Special Projects Coordinator. Interested in getting involved? Volunteer opportunities change depending on the location and time of year, but fall into several categories: classroom-related and event-related. Classroom volunteers are subject to host-school policies, including background checks. Once the school has approved you, you can help Matt teach kids to tie flies, teach aquatic education, assist with (or teach, if that’s your thing!) field trip presentations, and generally help keep any student chaos to a minimum. Event volunteers must be interested in helping to spread the Clean, Drain, Dry message to anglers, paddlers of all stripes, and people of all ages. ISAN attends a variety of events, depending on the time of year. No specific skills are required, but an interest in the subject of the event you attend is helpful.